The goal of the multi-stage rocket project is to successfully launch and recover a rocket with two or more stages. In particular, the team will focus on designing the upper-stage fins, stage separation mechanisms, recovery systems, and other parts unique to a multi-stage rocket. 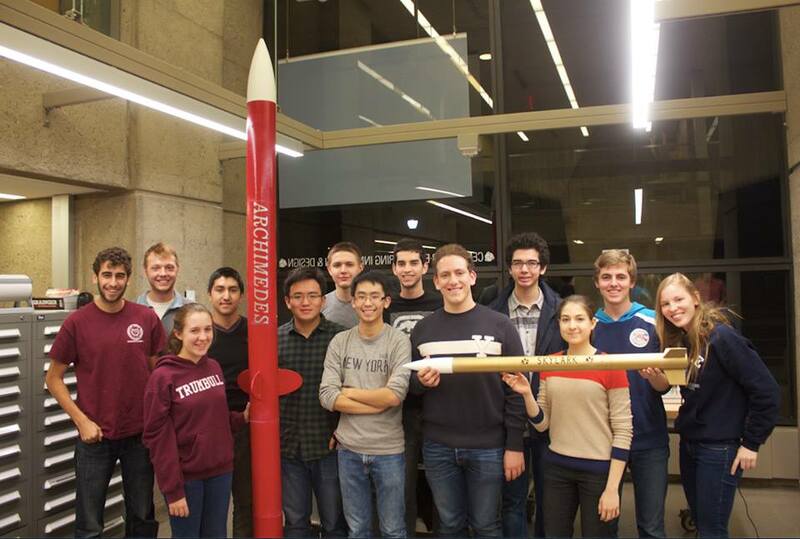 Over the course of this project, using a mixture of commercially available and custom-made components, the team will construct a rocket with the ability to reach an altitude of 10,000 feet. 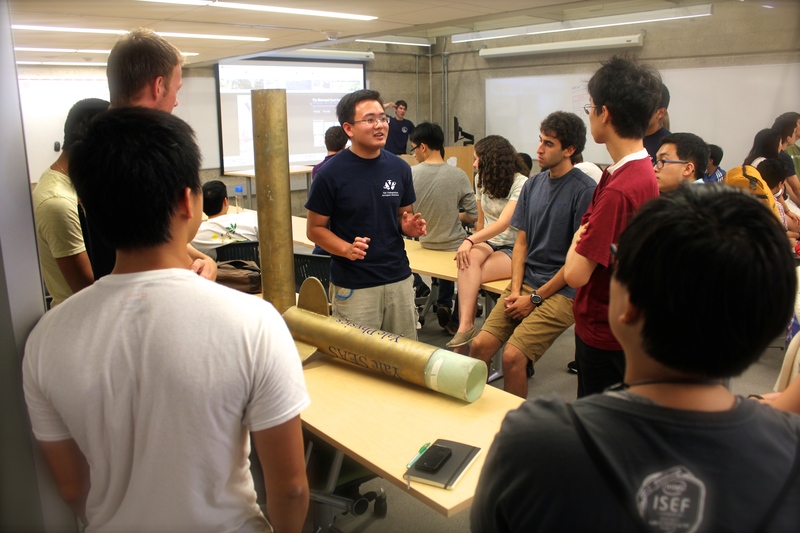 In the 2014 fall semester, the Multi-Stage Rocket team was awarded $1,000 in grant money by NASA’s Space Grant Consortium for Connecticut. Three YUAA teams received $1,000 each in grant money (the others being the Rocket Competition team and the Radio Telescope team), thus bringing YUAA’s total award to $3,000. 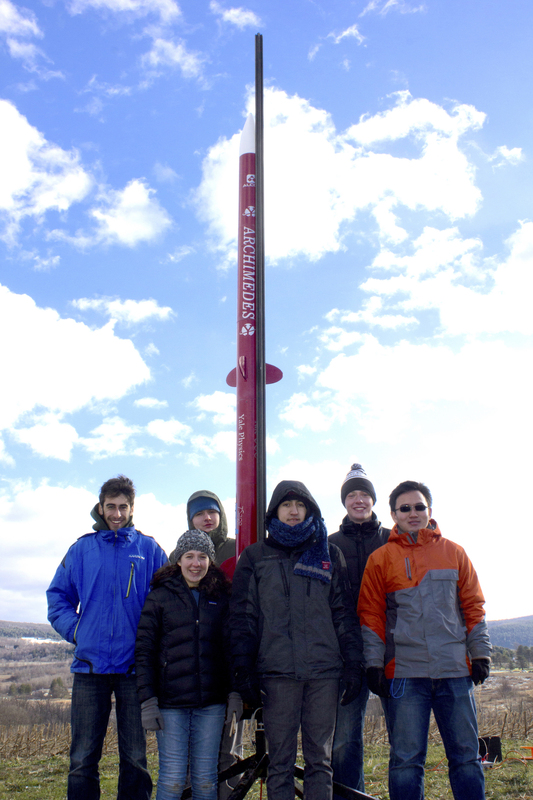 Along with the Rocket Competition team, the Multi-Stage Rocket team carried out a test launch in mid-November 2014 in the fields of Cobleskill, New York. For the test launch, the 9-foot tall red rocket “Archimedes” contained just one motor, but still separated into stages after deployment, and reached a peak altitude of 2,400 feet. Eventually, Archimedes will contain two stages, fired one after the other in succession in order to reach higher altitudes. The goal of the Multi-Stage team for the 2015 spring semester is to incorporate the second stage and its motor into their rocket. They are also working on refining the design, aerodynamics, and propulsion systems in order to enable Archimedes to reach even higher altitudes. Warren Zhang is the team leader for the Multi-Stage Rocket Project and is a sophomore economics major in Pierson College. He has been a YUAA member since freshman year when he worked on the 2013-2014 Rocket Competition Team.